While it is widely common that most plants do require some form of sunlight (such as direct or indirect) to grow, there are others that thrive in shady or complete dark areas. Some plants may only require a number of days or hours to be kept in darkness to regrow new blooms, while others require complete darkness indefinitely. Plants that require darkness are found deep within the forest floors or live underneath large trees as ground cover. Fungi dwell on the ground floor of the forest. They do well in an environment that is dark and damp. Fungi receive their food from other plants and animals. The plants reproduce by the wind scattering their spores. Fungi do not have any roots, flowers or leaves. 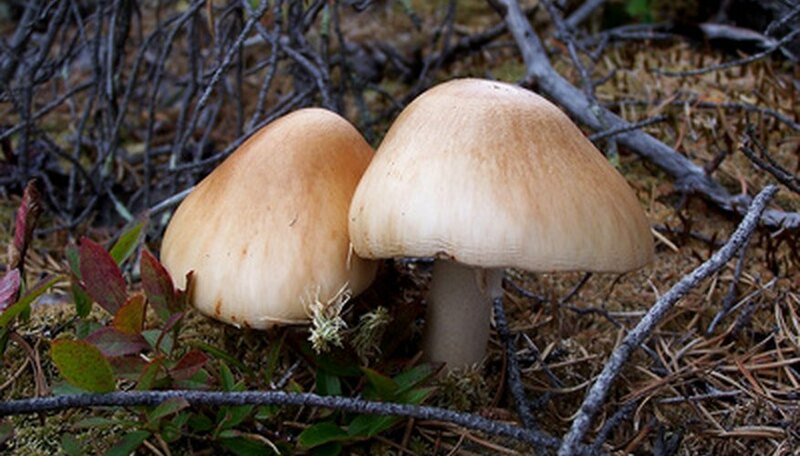 Fungi are also the source that helps provide drugs such as penicillin, and they are important in producing foods like mushrooms, truffles and morels. It can also cause diseases such as ringworm or athlete's foot. A Christmas cactus (Schlumbergera bridgesi) is an old-fashioned house plant that blooms red or red-orange flowers. The cactus should be potted in half sand and half fine bark or course peat moss. It also requires a lot of drainage. After the cactus has finished blooming and its flowers have fallen off, it is often kept in complete darkness to encourage new blooms. At the beginning of September, it is best to leave the Christmas cactus in the dark from 6 p.m. to 8 a.m. until it begins to form new buds. English ivy (Hedera helix) is a ground covering evergreen woody vine that thrives in the shade. An established English ivy will cover an area with a thick green carpet. The ivy will also climb up tree trunks as well, but can be maintained with annual trimmings. During the months of June through October, small greenish-yellow flowers will grow from it. English ivy is mildly toxic and its seeds are spread by the birds. The ivy usually grows in open forests but is able to adapt to other habitats that have moisture-like conditions too.